​Pre-loaded with big band tunes. Also great for listening to audio books in MP3 format! Easy to use and pre-loaded with music. Lift the lid to play! Playing music to those with dementia vastly improves their cognizance and lucidity - the effects can be dramatic, and are widely recognized by dementia and Alzheimer's professionals. Research has confirmed the benefits of providing people who have dementia with music they remember, and to offer it in an easy-to-use way. Quality of life at home, mental well-being and independent living are just some of the benefits of having an easy to use source of music! Holds 4GB of music, nearly 1000 songs! The Simple Music Player was designed specifically for those with dementia and has also shown great benefit to those with Autism, Stroke and for seniors. It is extremely easy to use even when a lack of dexterity is an issue. The volume is set by family members or caregivers and cannot, accidentally, be changed. The retro styling is reminiscent of old radios and is instantly recognizable as something which plays music. It's durable construction consists of a strong wooden enclosure with a high-strength plastic covering. The speaker grille is cloth and reinforced with a steel mesh to avoid damage to the speaker inside. Rubber feet keep the player from slipping. Wipe with a damp cloth to clean! 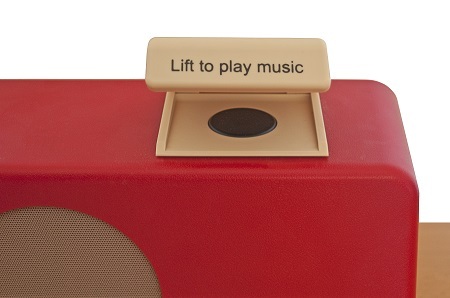 See the Real Benefit of Our Simple Music Player! Learn More About our Simple Music Player! How to Upload Your Own Music! Dimensions: 11.8" x 7.5" x 4.3"
A best-selling item for multiple years in a row! Play NAME THAT TUNE! Download up to 1,000 songs. Open the lid to play the first few words of a song and then close it ... let them guess. If they can't get the answer, open the lid and play more. When answered correctly, play the whole song or just press the button to start the next song! Q. I use an Apple MAC. I've deleted some files but they still play. How do I delete them? A. This is easy, but it has to do with how Apple works and nothing to do with the Simple Music Player or any other standard MP3 player for that matter. This is easily resolved but it’s an issue that occurs with many Apple users on many different devices and it really is a computer issue, not a Music Player one. Just by means of explanation ... the Simple Music Player looks and plays all the compatible files it finds on its internal memory regardless of which directory or folder they are in. The problem arises because Apple iOS doesn't actually delete the files when you press the 'delete' key, but creates a hidden sub-folder called '.trash' or '.trash-1000' and simply moves them into that folder. While you can't see the files, they still exist and so the music player is finding them and playing them. 1) empty the .trash folder. There is information how to do this at www.thexlab.com/faqs/trash.html#Anchor-Force-1148... for example. How to reformat? The Simple Music Player acts exactly the same as if it’s a USB stick or flash drive plugged into your machine, so formatting is just the same operation. There are lots of tutorials on the web (again this is a 'how to operate your computer' problem) - try this one www.pcadvisor.co.uk/how-to/storage/how-format-usb... and your problems should be solved. There's a very clear video at youtu.be/ac3jaZ7DjGg if you prefer video help. Q. Does it work in USA/UK/Europe/Asia/Australia? A. Units are supplied anywhere in the world. They are configured to have the correct mains adapter to suit the dispatch address on our order. Q. How many tunes can be uploaded? A. The internal memory is set at 4GB. Obviously the length of individual songs has an influence on the capacity. To some extent this is an academic question since most people with dementia are more than happy with a much smaller song list of say 25 to 40 tunes. Q. Can it use headphones? A. There is a headphone socket provided in the rear of the unit. Plugging in headphones immediately cuts out the main speaker. The socket is the light green one, the same as on your computer. Q. Dad can't move his hands very much. Is there any way he can use it? A. We have provided two sockets in the back panel which over-ride the ’ON/OFF’ and ’NEXT TRACK’ controls. Switches from OT suppliers are readily available but please remember this does require a higher level of cognizance to operate than many people with dementia. Q. I do not have files in MP3 format. What do I do? Q. When I use remote switches it stops when I press switch but starts when I release is again? A. You have the main lid open. To use external or remote switches you need the lid to be in the down position. Q. Why is the walnut version more expensive? A. We have to use a special technique and a more expensive production process to achieve this attractive finish. The casing is vacuum formed not injection molded for the-walnut version. Q. Do you know if/how to change the order of the songs the player plays? Does it always go back to the first song? Any way it can "shuffle?" Obviously as a cognizant person if you keep switching it on at the mains and it starts playing the same tune then it becomes monotonous but this isn't what we've found with people with dementia. The continual loop of familiar music is far more associative than a random shuffle facility. The requirement for 'shuffle' tends to be the desire of a fully cognizant person, not the intended user. This has been the best gift I've given my mom. It's easy to use and she loves it. We've loaded it with all of her favorite music. I highly recommend this music player! I think I love this player, but with just a week or so of operation, we've already experienced a problem. The player just stops periodically. Stops playing. When that happens, we shut the lid, pull the plug from the back, and put the plug back in, then open and it plays again (so far). This is not a good thing, though, as this won't work when my dad (who has AD) is alone with the player. Help? MINDCARE - The plug must be pushed in ALL the way until you hear/feel a slight click. This should prevent the power cord from disconnecting during use. Thank you! My mother who is 93 and has vascular dementia LOVED her "radio"!!! It is fabulous and I feel that every individual who has this devastating disease could benefit from the music of their era. I plan to recommend it to the Director of the memory care facility and encourage other family members to order one for their loved one! The ability to download the person's favorite musicians and songs is an added bonus. This product is phenomenal and my only regret is that I was unaware of it at an earlier date. This product needs to marketed at all Alzheimer's and dementia venues and also at assisted living and memory care facilities. As a matter of fact, my mother would have loved this before her diagnosis. The ease of use and the clarity of the sound would be beneficial to many elders. I personally will be promoting this amazing music player!